Meet Our New Guest Blogger! We welcome guest blogger Rev. 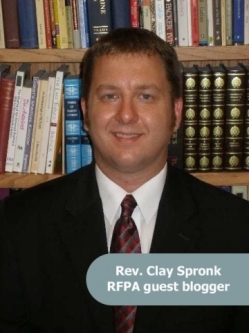 Clayton Spronk, pastor of Peace Protestant Reformed Church in Lansing, IL)! Rev. Spronk will be blogging for us several times a month, taking us first through a brief study of Richard Smit's newly released book, The Fruit of the Spirit of Jesus Christ. Look for his first post to appear on our blog on Monday, July 1! Click here for more information.